Attorney and Congressional aide elected to five terms in US Congress beginning in 2000, succeeding his former boss, John Edward Porter. 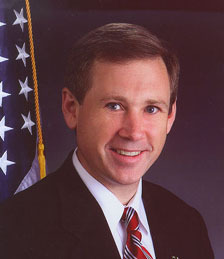 Elected to US Senate in 2010, succeeding Roland W. Burris and succeeded in Congress by Robert Dold. Centrist Republican; generally pro-abortion rights, pro-gay rights, anti-net neutrality. Supported 2001 USA PATRIOT Act, 2002 Iraq War resolution, 2005 Central American Free Trade Agreement (CAFTA), 2008 Wall Street bailout; opposed 2008 GM/Chrysler bailout, 2009 economic stimulus, 2010 health care reform. Suggested in 2007 that providing free contraceptives for Mexicans could help slow the problem of illegal immigration to America. Falsely claimed on several occasions to have received the US Navy's Intelligence Officer of the Year Award, apparently exaggerating the Vice Admiral Rufus L. Taylor Award, presented in 2000 by a private group, the National Military Intelligence Association. The award was given to Kirk's entire Naval unit, the Intelligence Division Electronic Attack Wing at Aviano, Italy, but Kirk, who was lead intelligence officer for one of the unit's four squadrons, was not mentioned by name in the citation. High school classmate of Rahm Emanuel.